Hi friends! I’m excited to start a new summer crochet along in just a couple weeks! Thank you so much for your interest in joining! 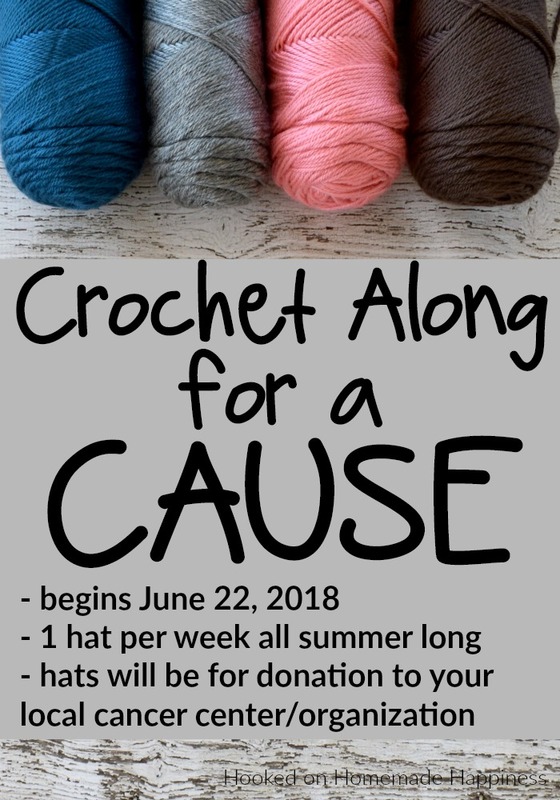 The Crochet Along for a Cause starts on Friday, June 22, 2018 and will last all summer long. Crocheting hats for cancer patients is something I’ve always wanted to do but (unfortunately) never got around to it. I thought it would be great for us to do this together! There will be 1 new hat pattern every Friday for 14 weeks until Friday, September 21, 2018. Each hat pattern will be made for donation to your local cancer center/organization. You can also send your caps to a love Crochet for Cancer chapter and they can distribute them for you. Be sure to join my Facebook group HERE for the lastest details, to ask questions, share your work, and talk with fellow crocheters! Most of the patterns will use worsted weight yarn with hook sizes 4.5 – 6.0. There might be a couple bulky weight hats sprinkled in as well. The yarn does need to be a soft cotton or acrylic. Please don’t use wool because it can irritate the scalp. Some good choices are Caron Simply Soft, I Love this Yarn, Red Heart Soft, but any soft acrylic or cotton should work. The patterns will all be beginner friendly, maybe a couple of easier intermediate. You will need to be familiar with basic crochet stitches and techniques. I want to try and mix up the patterns. The hats will range from children’s sizes to adult. There will be patterns geared towards women and some geared towards men. For some of the patterns I will have different sizes available so you can choose what size you want to make. And if there’s a pattern you don’t particularly like… skip it! Make a second of one you like better, or a completely different hat! Be sure to join my Facebook group HERE for the latest details, to ask questions, share your work, and talk with fellow crocheters! Hi Breann, I finished my first hat! How can I share it with you? Could you please help me with the pattern of the Ridge Beanie. I am on Round 9. I understand the 1st part of ch. 2, skip first stitch, dc in 3rd loop in next. Here is where I am having trouble – dc in 3rd loop in skipped stitch (previous stitch). How do I get back to the skipped stitch. Would really appreciate if you can help me. I’m a survivor from South Africa. I’m in! 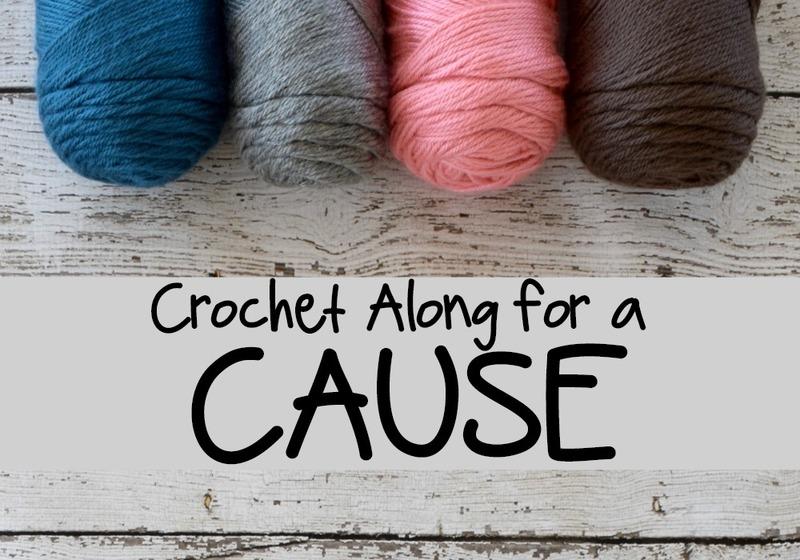 How do you get in on the crochet along for crochet for cancer? Would love to join this wonderful cause. I am not a facebook member. Can i get information through my email? Thank you for sharing your patterns. Love this first one! Glad to join. I too don’t do Facebook, so will pattern go to my email? This has been a fun and rewarding journey, as I lost my daughter to leukemia in 2015. I made many hats for other patients during her time of treatment and the James Cancer Hospital will receive all of these fun patterns for those dealing with the same struggle. Thanks for this crochet along. Count me in! Breann, I have made a few of your patterns so far and I love how easy they are to follow. I started crochet so I could make hats for the local children’s cancer center. My little sister was treated there and has now been cancer free for several years. There were so many kind people and wonderful donations that we really appreciated during her time there. It’s great to have a way to give back! Thank you for doing this, I know it will brighten the lives of many cancer patients! I’m in!!! Don’t do Facebook either but signed up for the newsletter. Will we just get a new pattern each Friday? I would love to do this . I am a knitter but have just started to crochet! I am so in! I can’t wait. I’d like to do it as well! This sounds like fun and a great way to help people in need! Count me in! Love this! I’m so in! Hi! I believe I joined your group a few min ago and also I send a text about hats and yarns! Please let me know if you receive I will wait for your answer! Hi! I’m not sure if I got your message. Where did you sent it? Hi: In the text that I try to send you yesterday I was saying that between my friend and me we were knitting hats different sizes and I have plenty, also I have plenty of yarns that I would like to donate to continue this great idea and help people with cancer! But I don’t know where or to who I can donate all this! I would like to try doing this. I do not do Facebook but have signed up for your newsletter. Will the weekly patterns be in your newsletter? I am going to follow you on Pinterest too. Thanks for what you are doing. What a lovely idea! I’m in! I’ve crocheted a lot of things but never a hat! I’m willing to give it a try, though. Sounds like fun and will help a lot of people! I would love to be included in this wonderful project. I’m excited. I’ve been knitting purple hats for our local hospital to remind parents not to shake babies when they cry. Looking forward to making these hats too. I lost both my parents to lung ca. ; in 2002 and 2014. I have wanted to do something like this for a while. There will be many tears…….but I’m in!! Thank you for getting me going. Can’t wait to get started. I lost both my parents to lung Ca. ; 2002 and 2014. I have been wanting to do something like this and now it feels right. Timing is everything. Count me in. I know there will be many tears as I make these; but I can’t wait to start! Thank you so much Breann—Thank you! Love to do this great idea. I am in as a survivor of cancer myself love this idea… I think it would be great to know location of other members, so that maybe we can get together to distribute this to local centers. I will start I live in Noethen Pennsylvania. I wwould love to do this please, i held a big morning tea and raised $250 for Cancer. Thank you for doing this. Can’t wait to get started. Would love to work on this project. Currently I’m working on items for a Cathlic School in KY with a teacher that runs the music department. This Nun teaches music as well as crochet, knitting and other crafts to the kids. In Oct the school has a fund raiser bazar and everything in the booth this teacher runs goes to the continuation of the music department. This year she hurt her hand and hasn’t been able to crochet as much and needs help. It sounded like a great thing to do. By the way this lady is sight impared, truly a remarkable person. Don’t do facebook but if you send the patterns I’m happy to help. Thank you. Is this a crochet at my own pace? Or do I need to make a deadline? I’m very new to patterns, I usually only make Afghans! I would love to help on honor of my 9 yr old granddaughter 1 year remission of Hodgkin’s lymphoma . Count me in!!! I have added to your face book group and invited my other crochet friends to join me in this!!!!! I would love to do this! Please add me to the list! I have friends that are interested but was wondering when is the drop off date? This is a great idea! The CAL will last from June 22 – Sept 21. Anyone can join at anytime! Count me in! I’m looking forward to doing this and using up some yarn! I would love to do this. My spouse was just diagnosed with mestatic carcinoma prostate cancer that has spread to his lymph nodes and bone marrow and is currently undergoing chemo. I will do my best to keep up as I am his caregiver, manage our company and full time college student. Hi! I’d love to try this. I signed up for your newsletter and asked to join the Facebook group. Looking forward to this! This is awesome! My husband was diagnosed with rectal cancer in April. He is starting chemo and radiation on Monday the 25th. This is our new journey and jumping in to this with you ladies would be a pleasure. God bless. I’m in. Can’t wait to see new patterns for hats. Thanks! Great idea! I’m in.mat the Lord bless you for doing those. Hi! I would love to be a part of this awesome idea and group. I am new to crocheting and have never made a hat before, just blankets and scarves (the very basics). Will there be detailed instructions for a newbie like me? My grandmother is a breast cancer survivor and lost my other family to liver and pancreatic cancer. Im in, just signed up for your newsletter. Have i missed any patterns thus far? I have been crocheting different sizes of hats for the oncology clinic at our hospital here in Canada and hospital for sick children.This is a very good idea. I like be to crochet and will join in, but how does this help cancer patients? Hi! It’s a gift for people going through hair loss due to their cancer treatment. It’s a way to support people in their battle with cancer. I’m from another part of the world… Indonesia to be exact. My friend and I would like to join your mission and donate them to the Cancer Center in my city. Would that be okay? I’m in, I too have been wanting to do something like this for a loooong time. I also joined your Facebook group! I’m super excited about this!! Do you do it in Ireland to? I’m in! Thanks for doing this. Looking forward to the patterns! I’m a survivor and also donate items to preemies/cancer charities already so this is definitely close to my heart. Can’t wait to make hats for cancer patients, please make sure I get the patterns too. I like to join the crochet for a cause team as well! I hope I’m not to late. I’m in. Thank you for gathering good people to meet a great need! Just a thought, my girlfriend (w leukemia) loved the wide headbands in lieu of hats some days, especially in the heat of the summer. I I wold love to participate. What do I need to do to get the patterns? Lost my mom to breast cancer and my aunt is in chemo treatments now. Want to do something for them. Wow, talk about serendipity. I live on a lake in Minneapolis, Minnesota. Across the bay the first hospice for children in the United States opened last fall. I was a manic crocheter for over 20 yrs. I now knit and crochet. Thank you soooo very much. I like working with Simply Soft. This will ne a spectacular endeavor. Hi, I just signed on and have a large stash from my mother and my own that I need to reduce and would be glad to add these hats to my list of ‘to do’s’. Right now I am working on hats for ‘Christmas boxes’, have made 80 so far. I just saw this on my email. I ran off the ones already published and I will be making them. Do I only make one of them or do I make as many as I can? I’m excited in starting them. I have so much yarn that my husband does not have his room or the closet. At least I allowed him to have drawers for his clothes. Some of these I will make in other colors because of the yarn I have if that is okay. Thanks. I’ve been working on hats for the homeless, but look forward to working your patterns and dropping them by a hospital.